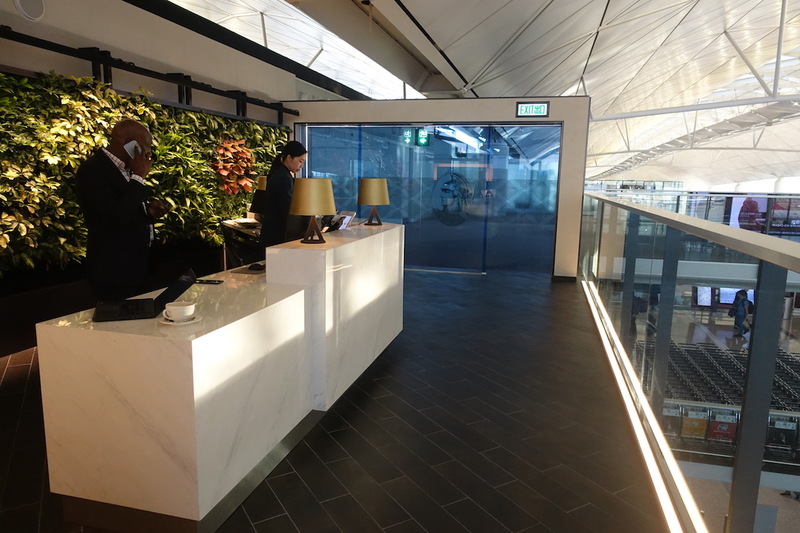 The Amex Centurion Lounge Hong Kong opened in early October, and I had the chance to check it out yesterday, and wanted to share my thoughts. As many of you probably know, American Express operates several Centurion Lounges, which can be accessed by those with The Platinum Card® from American Express and The Business Platinum® Card from American Express. 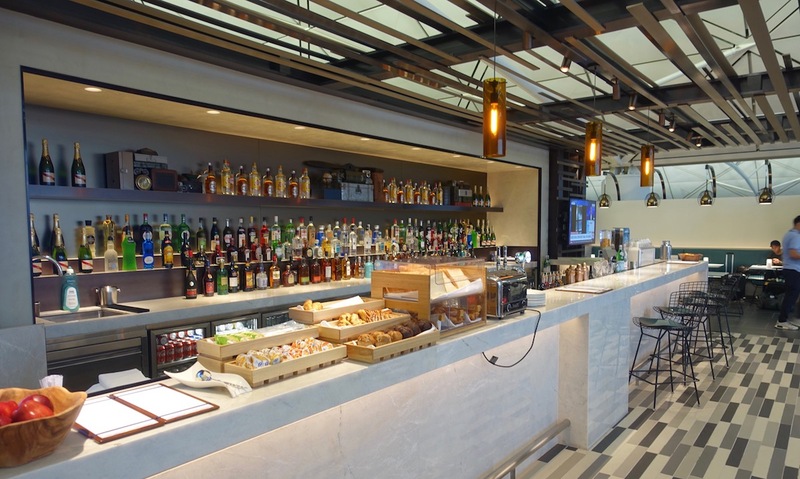 Most Amex Centurion Lounges are in the US, as they have locations in Dallas, Houston, Las Vegas, Miami, New York, Philadelphia, San Francisco, and Seattle. Amex also has some Centurion Lounges internationally, though I haven’t found them to be as consistently good. 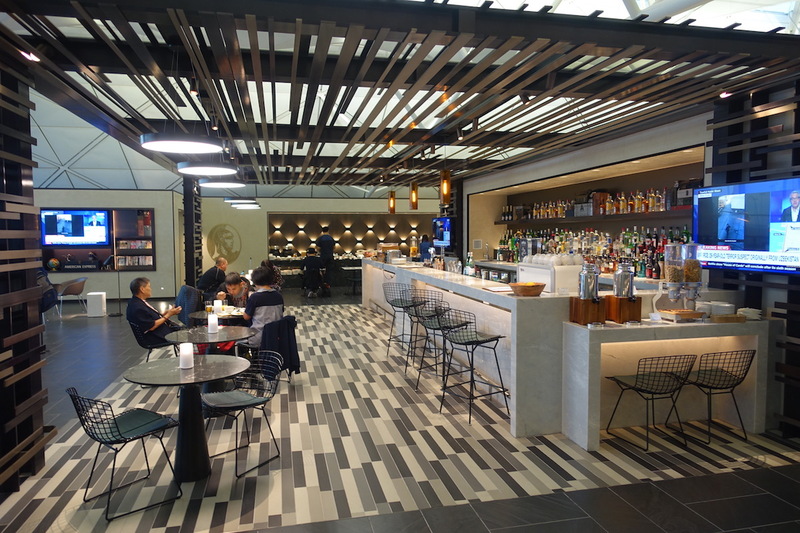 For example, I’ve reviewed the Centurion Lounges in Mexico City, Sao Paulo, and Sydney, and none of them really compared to what’s offered in the US. 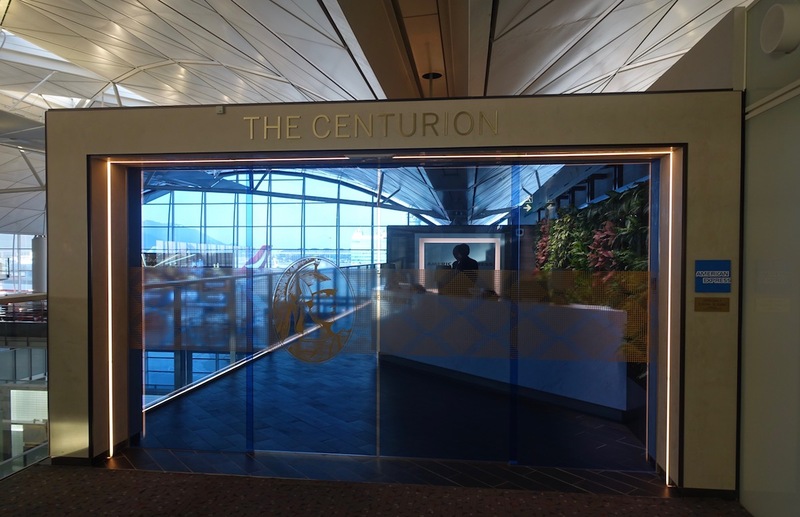 The Amex Centurion Lounge Hong Kong is the first Centurion Lounge outside the US that was built from scratch, so I was curious to see how it compared to the rest. For what it’s worth, the lounge is built in the space that was previously occupied by the Virgin Atlantic Clubhouse. 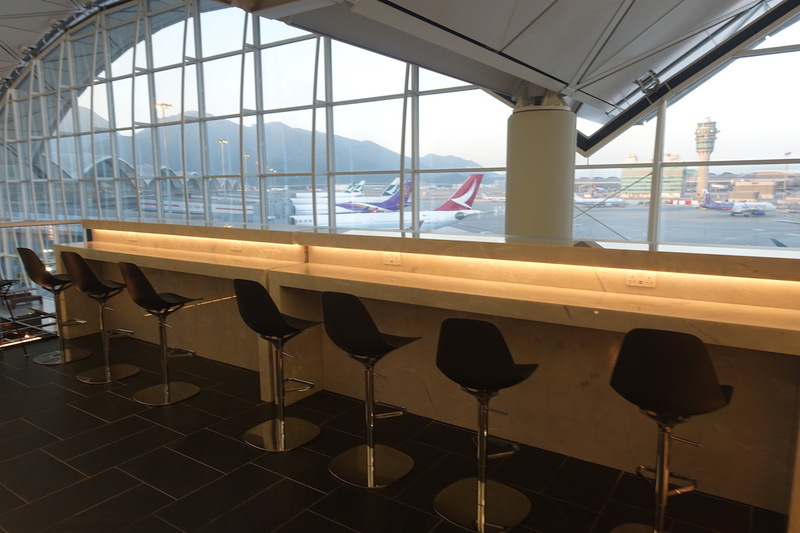 The Centurion Lounge Hong Kong is located in Terminal 1 of Hong Kong International Airport. It’s one level up from the main passenger concourse, and you can access it using the escalator near gate 60. When you walk down the long main concourse at the airport, turn right when you get to Cathay Pacific’s Bridge Lounge. At the top of the escalator turn right, then turn left, then turn right again. To the right is the United Club, then there’s the Priority Pass lounge, and then there’s the Centurion Lounge. The Centurion Lounge Hong Kong is open daily from 5:30AM until 12:30AM. Those with The Platinum Card® from American Express, The Business Platinum® Card from American Express, and American Express Centurion Card receive complimentary access to Centurion Lounges. Those with the above cards can bring in up to two guests at no additional cost. Much like the rest of the Centurion Lounges, this one has the signature exterior with tinted blue sliding doors, and then a reception desk with a wall of plants. The associate at check-in was friendly, as I find to consistently be the case at Centurion Lounges. He explained where the buffet was located, and gave us the wifi password (which was the same as at all the other lounges). The main part of the lounge is located down a long walkway and to the right. As you go down the walkway there’s a larger meeting room with a TV, then there’s a smaller meeting room, and then there’s a phone room. While I get that they like to have a meeting room as an amenity, given the limited size of the lounge I feel like all of this space should have just been used as part of the standard lounge. Below is the view in the opposite direction of all these rooms. At the end of the hallway was some American Express art and two chairs, and then the rest of the lounge was to the right of that. The Centurion Lounge is allegedly about 8,000 square feet, though to me it feels a bit smaller than that, as the lounge just consists of one main room (there’s also a private area for Centurion members, which might explain why the lounge doesn’t feel bigger for most of us). The centerpiece of the lounge is the cafe and bar area. I’m not even sure how to describe the design, but it’s pretty visually striking. Next to that are three sets of four chairs, with a TV along the wall. There’s additional cafe seating right by the bar on the side closest to the entrance, with a further six tables seating two people each. Lastly, there’s some high-top seating facing the ramp that seats seven people. While there are nice views from the lounge throughout, you can’t beat this view of the lineup of heavies just outside the window. The main buffet area is at the far end of the lounge along the wall. I was there early in the morning, when breakfast was being served. In terms of the breakfast selection, there were five types of salads in bowls, yogurt, cold cuts, cheese, pancakes, scrambled eggs, hash browns, vegetables, sausage, bacon, dim sum, oatmeal, and chicken congee. There was also apple and orange at the buffet. Across from the buffet was a drink station, with soft drinks and Twinings tea. While minor, its nice that they have San Pellegrino and Acqua Panna water. Along another wall was a Melitta espresso machine. Along the bar area was cereal, pastries, muffins, and bread. Centurion Lounges are known for their great cocktails, and this lounge had a delicious-sounding list. However, since it was so early in the morning, I didn’t try any. Personally I was excited when I saw that the lounge had a proper espresso machine with a Lavazza grinder. If there’s one thing I appreciate it’s good coffee, and there’s a big taste difference between a machine coffee vs. a coffee made freshly by the barista (if nothing else, the taste of the milk is significantly different). So when I saw this machine I asked one of the lounge staff if it would be possible to get a cappuccino from this machine. She responded “there’s a machine over there you can use.” “Yeah, but would it be possible to get a cappuccino from here instead?” “You can just go over there and push the button.” At that point she walked over to the machine with me and pushed the button for me. Everyone working in the lounge was nice otherwise, so I’ll assume I just wasn’t being direct enough or that it was a miscommunication. Go figure that two minutes later I saw another lounge staff member using that machine to make a coffee. The lounge had similar bathrooms to the ones I’ve seen at most other Centurion lounges, with the shared sink and two stalls and two urinals in the mens bathroom. On top of that there were two shower suites, but they were both occupied when I visited. All of this was located behind the bar area. On the plus side, this is the nicest Centurion Lounge I’ve visited design-wise, and is a substantial improvement over other international Centurion Lounges. The lounge was smaller than I was expecting, though wasn’t too crowded. The lounge staff were friendly, the views were great, and I liked that it overlooked the rest of the terminal, so felt spacious. The cocktails and wine selection were great as well. However, I have one area that disappointed me, and one general thought. In terms of being disappointed, I thought the food selection was unimaginative and bland, and I would have expected to see something similar in a Priority Pass lounge. In fairness, breakfast is often the blandest meal in a lounge, so maybe the selection is better other times of day. Then there’s my other overall thought. What makes Centurion Lounges in the US so nice is that usually US airline lounges are garbage, at least historically. Getting innovative cocktails, premium drinks, and good tasting hot food is a novelty in a US airline lounge. That simply isn’t the case in Asia. In Asia just about all lounges are good, and just about any airline lounge is going to be nicer than this. In the case of Hong Kong, I’d say all Cathay Pacific first & business class lounges are better than this in terms of the food & drink selection. So it’s not that the Centurion Lounge isn’t nice, but rather that the standard of lounges is higher in this part of the world, and therefore there’s less of a “wow” factor with these lounges. I’ll be sticking to Cathay Pacific’s First Class Pier Lounge from now on (not that I was expecting the Centurion Lounge to be better) when flying oneworld. However, for those who don’t have access to a good airline lounge in Hong Kong, this is a very nice addition. 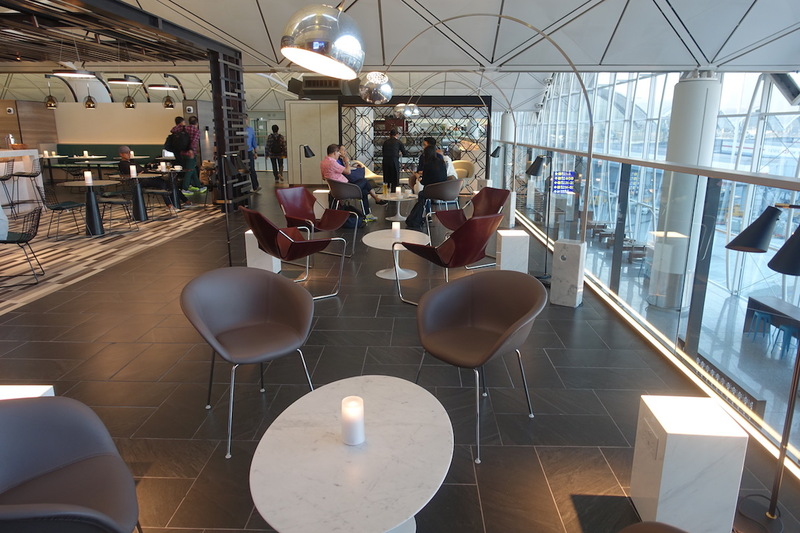 What do you make of Amex’s new Centurion Lounge in Hong Kong? Do you plan on visiting? Did you mean Wifi password or passport ? Lol, next time order your cappuccino directly from the bartender. They made a great one for me. Yeah, the food looks pretty disappointing for a Centurion lounge. Maybe it’s worth it over the Cathay business lounges if they are too busy and this one isn’t. I’ve had a good experience at the Virgin lounge in HKG, which has table service and a menu to order from which might put it a step above this one. now you are going into the heart of enemy territory, what prevails at home is a pale blimp on their radar screen. much like the US big 3 airlines, the lounges suffers the same defeat at the hands of asian counterparts. i had a better meal in their 1.5 hr economy flight than a 3-hr first class meal in US. how would you rate vs QF lounge in HKG ? Centurion cardmembers also have access!! One thing that I found odd was that there’s seating where the cereal towers are located. That means that if the lounge is full, you have to reach over someone to get cereal. It looks pretty, though. This is the first centurion lounge, other locations (SYD, DEL, EZE, etc.) are just Amex international lounges. This looks like a substantially better breakfast spread than at the SFO CL. I mean, I could eat my weight in dim sum, so maybe I’m biased. But yeah, it’s definitely “meh” for the CX lounges nearby, but we US-based flyers have a low standard already. Thanks for the write-up! Disappointing that it’s so small and there’s really no “lounge” seating. Compares poorly to the CX J lounges in pretty much all respects. Maybe I’d stop for a bite if I were flying UA, but can’t otherwise see any reason to visit. Except for the dim sum and congee there’s nothing for breakfast, lunch or dinner that fits that description. I have yet to see scrambled eggs, bacon, sausage, steamed vegetables, tater tots, and shumai offered in a Priority Pass lounge. In addition to the San Pellegrino and Acqua Panna water. So I don’t know if I’d call that similar to a Priority Pass lounge. I mean, short of an omelette station, those are actually the standard breakfast items you’d see in a mid to high tier hotel buffet breakfast. I think they also have Michelin star design BBQ pork rice and edible bird’nest egg tart for the black card member. Others have commented and I concur: this looks like a good lounge but only if you don’t have access to either lounge(s) of Cathay Pacific or Qantas. Especially the Qantas lounge! Anyone else surprised that there is no spa here? Given the low cost of treatments in HK/SE Asia in general, you’d think it would be a no brainer. Would be a much better use for that conference room space IMO. AusBT has a review with a bit more detail about what’s behind the door for Centurion card holders (https://www.ausbt.com.au/american-express-centurion-lounge-review-hong-kong-international-airport). Turns out it’s an a la carte dining room with a menu designed by a 2 Michelin starred chef. Now if they opened this up as part of the main lounge, they would really have something. Agree CX and QF lounges look much better. 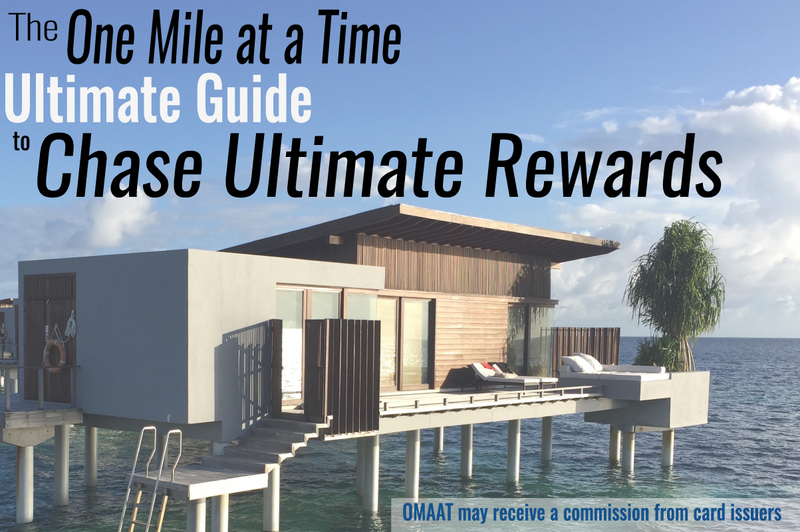 One possible advantage is that you can get two guests into the Amex lounge, which depending on your oneworld tier may be more than you can get into a oneworld lounge. @Lucky I think u are wrong. If you look AMEX website, Hong Kong is the only CENTURION lounge. Others are called AMEX Lounge. HKG Centurion lounge is pretty meh. The food is catered by Priority Pass so it’s bland and unimaginative. Went there for dinner and the food wasn’t edible. This one is one of the wort lounges in the Amex network in terms of food offerings. Just came through HK this weekend, and looked at Centurian as well as Cathay Pacific Business class lounge (at Gate 65). No comparison. If I had the chance to choose the CP lounge, it is heads and shoulders better – complete with noodle bars and tea bars and food bars and big and spacious places. The Centurian lounge was a disappointment – with the lounges in the US – specifically San Fran and JFK even a better overall experience. I can’t believe that AMEX is putting a subpar lounge in Asia – where already so many lounges are so much better. HKG Centurion lounge is pretty good. Was there middle of October. Food quality is pretty good. Just not a lot of variety. Staff is very friendly. When I was there went around frequency and asked if wanted more to drink. Lot better then Premium Plaza lounges in HK which are overrun. Premium Plaza caters and runs the lounge. MD think you got it confused when you said Priority Pass caters. My main issue are the seats. They might look good but uncomfortable and small. 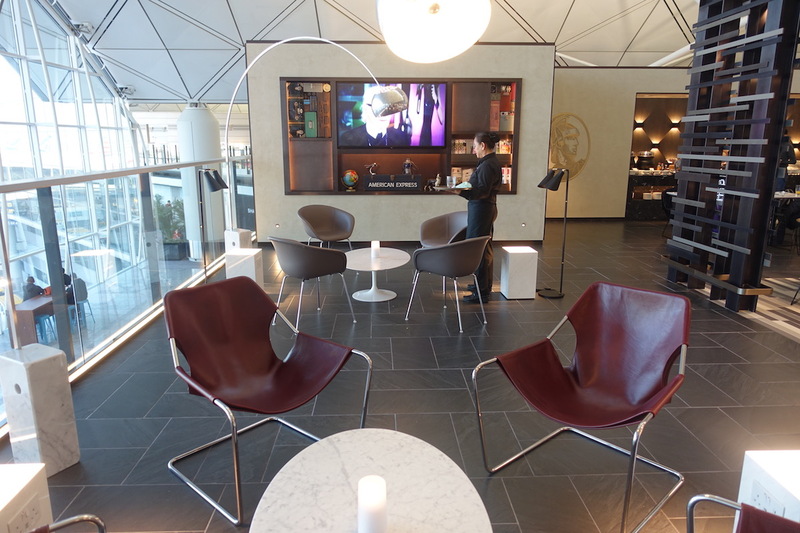 If you were flying Star Alliance and had access to this lounge, would you visit this lounge or the United Club (which is probably the best Star Alliance lounge in Hong Kong)? I was transiting HKG a few days ago and in the Centurion Lounge. As luck would have it the gentleman I sat next to was a corporate AMEX employee. He was interested in my feedback on the card and I told him it’s the reason I’m in Asia right now (95,000MR’s to ANA for RT LAX-PEK-HKG-ICN-LAX (PEK-HKG was open jaw) in J. A tasty nugget: I inquired about a lounge coming to ORD and he smiled and was emphatic with “stay tuned, it’s coming!” That’s all he would give but was definitive and when someone else overheard and got excited he said: “it hasn’t been announced yet so just… stay tuned is all I can say.” I’m based in ORD so am elated! I’m speculating maybe they’ll overtake the original AA FL lounge at the far end of the K-gates unless that is already spoken for. Hopefully they do not put the lounge in T1 as it’s all United (similar to the crap they pulled at SFO’s location). I was at the HKG Centurion Lounge a couple of days ago, (Nov 1). I was in Cathay Pacific’s business class to Male so I was excited to visit one of their lounges, but when I saw the Centurion Lounge, I made a detour and camped out there. I have to say, I was thoroughly UNIMPRESSED! The Miami and Dallas Centurion lounges are much much better, even though they are more crowded as well. I found the HKG lounge uninspiring, uncrowded, bland and meeh! I am sorry I did not choose the Cathay Lounges. I know better now. As stated, we are so used to the terrible lounges in the US, that the Centurion Lounges are a bright light in an otherwise dim canvas. What I did not like about this HKG lounge was the food. And seating. I was there in the afternoon and I did not have one thing to even mildly rave about. And the chair I was sitting in was so uncomfortable that I had to move. Who lets decisions about furniture get through with the choices they had? He/she should be fired. While it was a nice respite from the crowds, the HKG airport is not overcrowded and I also enjoyed the wide terminal space when I left the lounge. Next time, Cathay, I will stay with you. On a positive note, I flew 1st class from JFK to HKG the day before and was able to experience AA Flagship First dining and lounge. I have to say it is by far the best in the country (USA) now. I am a Delta Diamond and while Delta has upped their game, this JFK Flagship lounge was very spacious, not overcrowded, has excellent food choices and the Dining Room’s offerings were sooo delicious. Good job AA. I was there is Oct and I have to say the main lounge is small but the Centurion area is lovey. It is divided into a lounge (with odd bars going floor to ceiling which is a bit prison-like) and a dining room. The food was excellent and the staff were incredibly attentive. I think they are trying to attract Chinese Centurion members. The only issue is some machine which keeps alarming and is quite disturbingly annoying! Well worth a visit if you have a Centurion card and certainly useful for those without airline status, but on balance, Pier First every time! Yeah, agreed about the last point. Looks nice but probably not going to sway anyone from the Cathay lounges. Lucky I agree with your general point that this pales in comparison to the outstanding CX J and F lounges but this looks miles better than the existing priority pass lounge (plaza premium) in HKG, so I don’t think there’s really a comparison there. This is a godsend for those of us that fly QR out of Hong Kong now and then as their contracted lounge is the dreaded plaza premium priority pass lounge… I do wonder how crowded this we’ll get at peak late evening hours. Hmm. I was excited to come through here next month but I might stick with the UA lounge?? It doesn’t appear that there is a kids section of the lounge as some of the other Amex Lounges have, did I understand this an the AU review correctly on that? I’ll be passing through HKG in a couple months and would love a little playroom for my 5 year old without disturbing others. Any other place in HKG for kids to play at the airport? I have to say this doesn’t come close to the CX First Wing and Pier lounges. But I guess being Asia based I am just a boiled sprat! The Qantas First Class Lounge at LAX is also much better. As with some other sub-par Amex lounges ie Seattle, this one goes … cramped lousy seating, over-crowded with loud sweaty “premium” people. Save the agony and use the Cathay or Quantas lounges nearby if you have access. I’m based in Las Vegas and our Centurion lounge there is head and shoulders above this HKG edition.